Approximately 290 students enter in for a Patriotic Education/Military Science All Class Formation on Wednesday, Dec. 5, 2018. 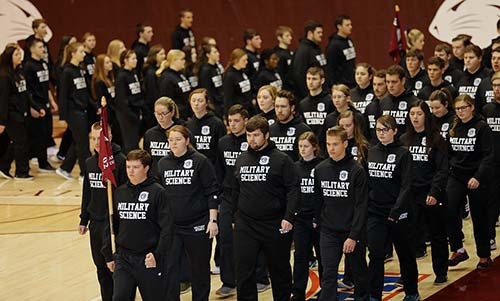 All six sections of the Patriotic Education and Fitness Class enter in formation to the Military Science All Class Formation. The students spent ample time rehearsing the process of marching and staying at attention during formation. Freshmen enrolled in the course stand at ease while Captain Dunnam introduces Brigadier General David Boyle. Colonel Schreffler congratulates his students on their discipline and hard work in learning to march and stand in formation. Brigadier General David Boyle accepts a gift of a military science sweatshirt to commemorate his participation in the Military Science All Class Formation. POINT LOOKOUT, MO. 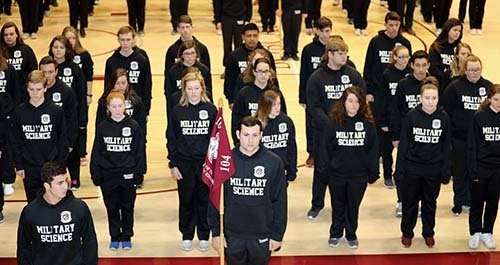 — The Patriotic Education/Military Science All Class Formation of approximately 290 students took place at 8 a.m. on Dec. 5 on the College of the Ozarks campus in the Keeter Gymnasium. This event represented the culmination of the military science course, Patriotic Education and Fitness, at the College. Brigadier General David Boyle, Joint Staff and Joint Task Force Commander at the Missouri Joint Force Headquarters, addressed the assembled students. All six sections of the Patriotic Education and Fitness Class entered in formation and sounded off at the appointed time. Brig. Gen. Boyle was born and raised in Ohio where he joined the National Guard as a communications specialist in 1980. He has been commissioned as an Engineer Officer through the Army Reserve Officer Training Corps and has a Masters in Business Administration and a Masters in Strategic Studies. He commanded the Missouri National Guard’s 7th Weapons of Mass Destruction Civil Support Team and Missouri’s 2nd Agri-business Development Team in Nangarhar Province, Afghanistan. The 4-credit hour course is part of the general education program. The program, which began in the fall of 2017, is designed to support the College’s patriotic goal: to encourage an understanding of American heritage, civic responsibilities, love of country, and willingness to defend it. Since then, the College has required this course of all freshmen. 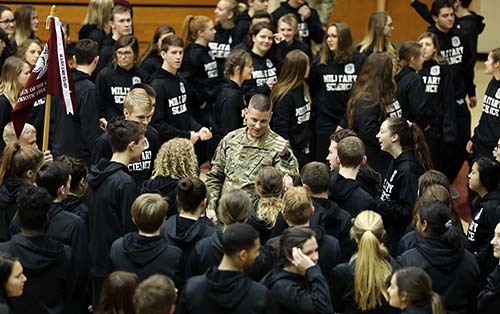 “Students in the class will learn a wide range of skills that most College students will never have the opportunity to experience,” said Bryan Cizek, director of patriotic activities. “They will learn map reading, land navigation, rifle marksmanship, rope systems and knots, and rappelling. They also will take an in-depth look at the formation of American government and politics, modern military task organization, military customs and courtesies, and flag protocol and procedures. The class is structured to meet three requirements for students which in the past they would have completed separately: the academic requirement for the first year of the Missouri Army National Guard Bobcat GOLD curriculum, one physical education requirement, and the freshman Patriotic Education requirement. 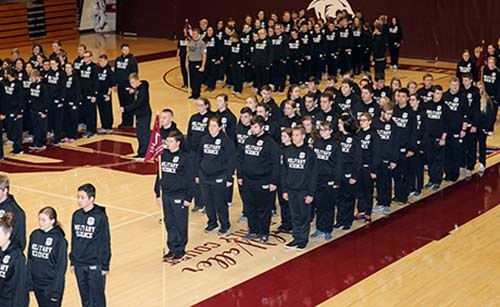 For the physical training portion of the class, students run in formation and complete basic callisthenic exercises including push-ups, sit-ups, and other workouts. Students are graded on their participation and their own personal improvement.